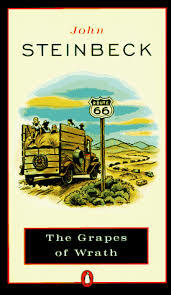 Essays on a summary of The Grapes of Wrath discuss John Steinbeck’s story about the Joad family’s journey to the promised land of California. As the novel opens, Tom Joad had just been released from jail. He returns home, but cannot find the rest of his family. The next day he and Jim Casey, a former preacher, find the rest of the Joads preparing to leave for California. Along the way, Grampa Joad dies, followed by Grandma Joad soon after they arrive in California. Along the way, they discover that California is not the paradise of work that they believed it to be. The Joad family find themselves moving from one camp to another, trying to find work and keep from starving. Soon, Noah Joad leaves the family, as does Rose of Sharon’s husband Connie, leaving the pregnant girl behind. Life in California is difficult for the Okies, resented and feared by the locals. Tom soon learns that the police are planning to stage a riot in a government camp, in order to drive off the Okies. Tom runs into Jim Casey, who has been organizing workers, but the police kill Jim, and Tom kills a policeman in return. Tom departs to organize workers across California. Rose of Sharon gives birth, but the child is stillborn. The family takes refuge from the rain in a barn, where they encounter a boy and his starving family. In the final scene, Rose of Sharon nurses the dying man, being able to provide for him the only food available. Characters in The Grapes of Wrath - Characters in The Grapes of Wrath research papers are custom written by Paper Masters. The Grapes of Wrath - Essays on a Grapes of Wrath Summary discuss John Steinbeck's story of the Joad family's journey to the promised land of California. The Pearl by John Steinbeck - The Pearl by John Steinbeck research papers discuss the many critical themes in Steinbeck's novel. Summary of The Pearl - The Pearl Summary tells the story of a pearl diver named Kino. Archetypes in Literature - Not only is Ishmael's voyage on the Pequod this type of archetype, but so too is the journey of Tom Joad in The Grapes of Wrath. Paper Masters writes custom research papers on A Grapes of Wrath Summary discuss John Steinbeck’s story of the Joad family’s journey to the promised land of California.